I read the book, and that made me want to watch the movie. I did not have high hopes cos sci-fi is tricky. It can be bad silly, it can be too tech, it can be too dull. But this was amusing. 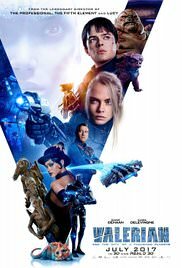 Though Valerian was as much as a d*ck as in the books. I just do not like that guy. First he was all hopeless, but then he was like super agent. Whatever Valerian, you are a d*ck. It just felt a bit too much you know, especially in these times. He was all Laureline wink wink. Did not like the actor either. But Delevingne was good, and saved the day. Rihanna can not act, tragic. Totes ruined her part. Action, aliens, a few jokes. I enjoyed it. Oh and cried. Damn! Oh these hormones! So sure, you can watch it. It was amusing. Although I like Luc Besson's other works, still not sure if I want to see this one. I enjoyed this one. It was fun and light. I don't tend to watch sci-fi movies so this was a nice compromise for a movie out with my husband.